He is the author of China's first medical textbook and of its code of ethics. Produced in AD 652, "Qianjin Yaofang," or "Essential Prescriptions Worth a Thousand Pieces of Gold," was a milestone in the history of traditional Chinese medicine. Its title reflects a firm belief of its author, Sun Simiao (circa 581-AD 682), known as China's King of Medicine. Sun once said: "Human life is of paramount importance, more precious than a thousand pieces of gold; to save it with one prescription is to show great virtue." Sun was born in a place called Huayuan in today's Yaoxian County, Shaanxi Province in northwestern China. However, it was not a healthy place in which to live at that time, as many locals contracted unusual illnesses. Sun's father was afflicted by night blindness and his mother suffered from a swollen thyroid gland. Sun himself did not escape ailments and was a sickly child. Surrounded by so much illness, the boy studied hard as he was determined to become a doctor to help treat his parents, relatives and neighbors in his home village. In addition to various Chinese classics, the young Sun dug deep into every medical treatise he could lay his hands on. He also traveled to various places to collect folk and family medicine recipes and study the medicinal effects of thousands of herbs. He was particularly interested in the identification and preparation of herbs. Sun began his medical practice at the age of 18. In time, thanks to his exceptional skills and the deep care he showed his patients, Sun was able to cure his parents and treat many other people in his home village. As Sun's renown spread, it earned him the name King of Medicine and he began work on the 30-volume traditional Chinese medicine encyclopedia "Qianjin Yaofang." The book contains a total of 5,300 prescriptions and covers topics such as gynecology, pediatrics, cold-induced disorders, internal diseases, detoxification, diet therapy, acupuncture and herbs themselves. In addition, "Qianjin Yaofang" contain commentaries on clinical practice and treatises on how to keep in good health. Handy hints include tips for a healthy diet and exercises such as combing your hair, rolling your eyeballs and walking. 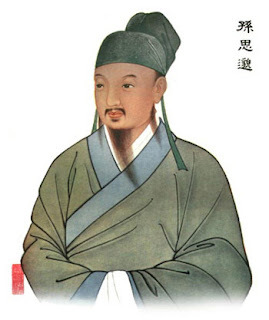 Sun's "Qianjin Yaofang" not only summarized all pre-Tang Dynasty (AD 618-907) medical achievements, but also laid the foundations for traditional Chinese medicine ethics. In the first volume, Sun detailed his views on TCM ethics in an essay called "Dayi Jingcheng" or "Absolute Sincerity of Great Physicians." Sun wrote: "When a great physician treats patients, he must maintain his inner serenity, pay no attention to personal desires or demands and feel great sympathy for the patients." "He should vow to save people from their sufferings, no matter whether they are nobles or ordinary people, rich or poor, old or young, attractive or unattractive, friends or enemies, Chinese or foreign, educated or uneducated. He must treat them all on equal grounds and as his own close kin." Later, Sun's views on medical ethics were recognized as the first code of conduct for physicians in China. Soon after finishing "Qianjin Yaofang," Sun went to live in seclusion on Panyu Mountain in his home province in northwest China. The mountain later became known as Medicine King Mountain. There, Sun studied Taoism, and later integrated Taoist principles with Buddhism and Confucian doctrines. Years later, summing up his clinical experiences and medical classics, Sun wrote a second medical book, entitled "Qianjin Yifang" or "Supplement to the Prescriptions of a Thousand Pieces of Gold." This second book, also written in 30 volumes, contains about 2,000 recipes for medicines. The two books were later translated into many other languages and were once used as textbooks in Japanese medical schools.